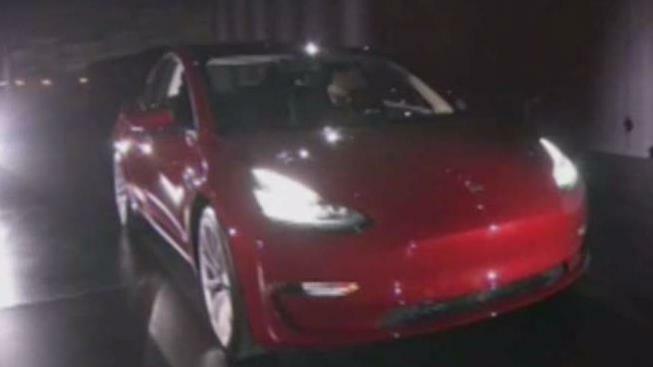 Tesla's much talked about Model 3 sedan is making its first public appearance in the Bay Area on Friday. The all-electric, consumer-friendly sedan will be on display at Tesla's Palo Alto showroom, offering reservation holders and prospective buyers their first up-close, in-person look at the vehicle. The store at the Stanford Shopping Center is one of two locations where the car will be on display. The other is at the company's showroom in Century City, near Los Angeles. Tesla delivered 1,770 Model 3s to buyers in the second half of 2017, according to Bloomberg Businessweek, but production and delivery have been far slower than CEO Elon Musk projected. The base price for a Model 3 is $35,000.